This Cheddar Steak Egg & Cheese Biscuit Sandwich is the perfect breakfast sandwich to start your day or the perfect breakfast for dinner option. 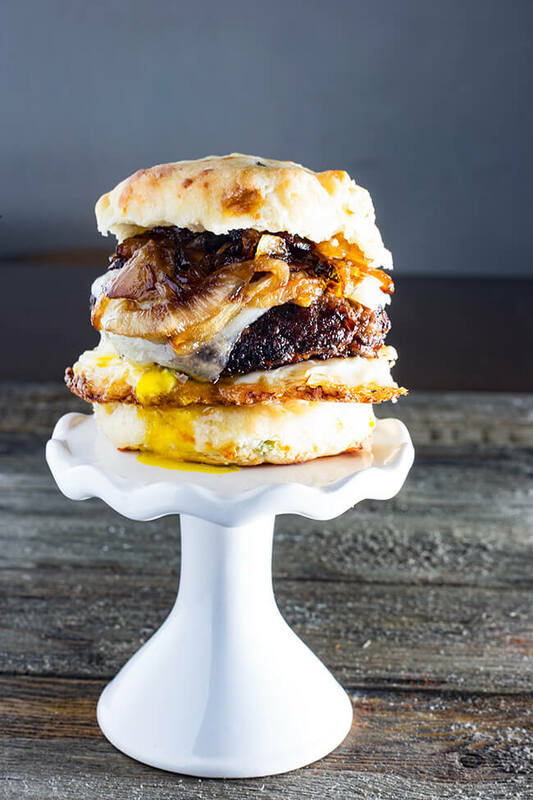 A mouthwatering country-fried steak on a freshly baked, scratch-made biscuit topped with a crispy fried runny egg and spicy carmelized onion. This is it! Well hello there! I might officially know what a food coma truly is. We had this for dinner last night and it was AMAZING! 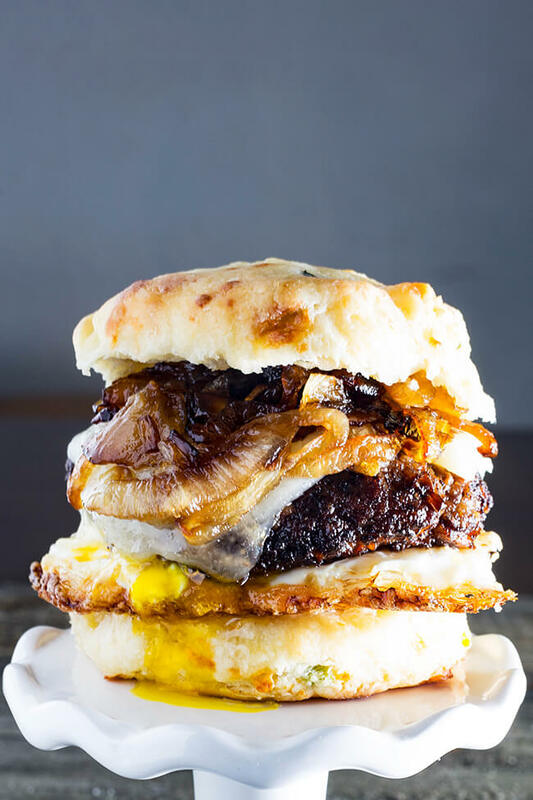 Basically, this sandwich consists of a flaky cheddar scallion biscuit, a crispy fried egg, juicy pan-fried steak and spicy sweet caramelized onion!!!! Yup, you read that right. And for good measure, I added some smoked provolone cheese. I really struggled in naming this sandwich but alas I settled on Cheddar Steak Biscuit Sandwich. Remeber these little gems from my last post? I loved them so much I made a second batch and out of that batch came this sandwich. it was indeed absolutely necessary. 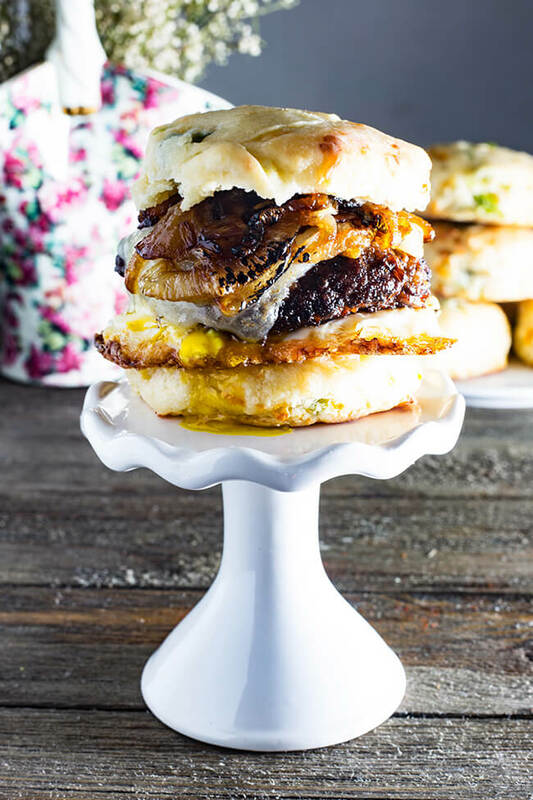 This Cheddar Steak Biscuit Sandwich has everything- sweetness and spice from the onions. I fried the egg until it was crispy but the yolk was still runny- which in my opinion is the only way to have a fried egg. And can we really talk about the cubed steak- I tried to make this recipe with a different cut of steak but nothing was as tender as the cubed steak. And with good reason, cubed steak is basically a tenderized cut of meat. Which make is easy to fry and eat in a sandwich. 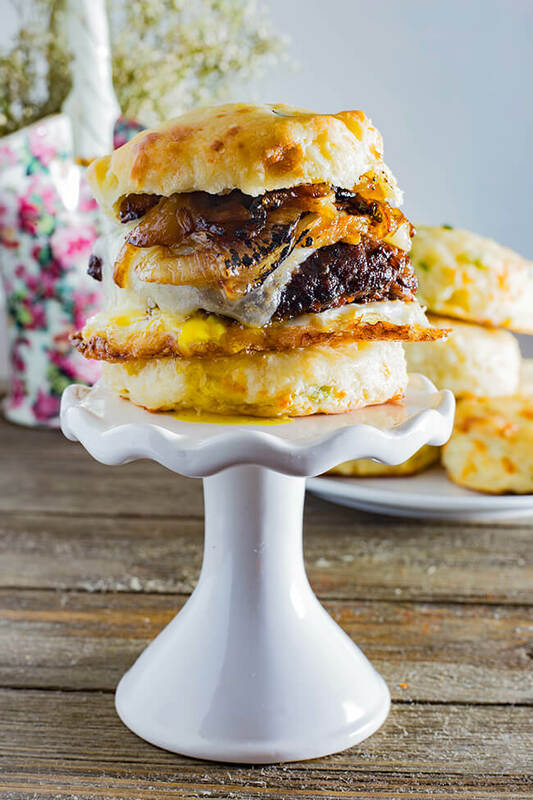 I hope you upgrade your breakfast with this easy and absolutely delicious Cheddar Steak Egg & Cheese Biscuit Sandwich. You can change up the toppings too – GO WILD! Add some tomatoes, some beef bacon, or dare I say a couple of slices of avocado (Abdel’s topping of choice). Just have fun with this recipe and tell me how you liked it. 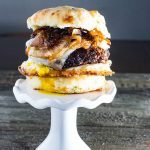 This Cheddar Steak Egg & Cheese Biscuit Sandwich is the perfect breakfast sandwich to start your day or the perfect breakfast for dinner option. 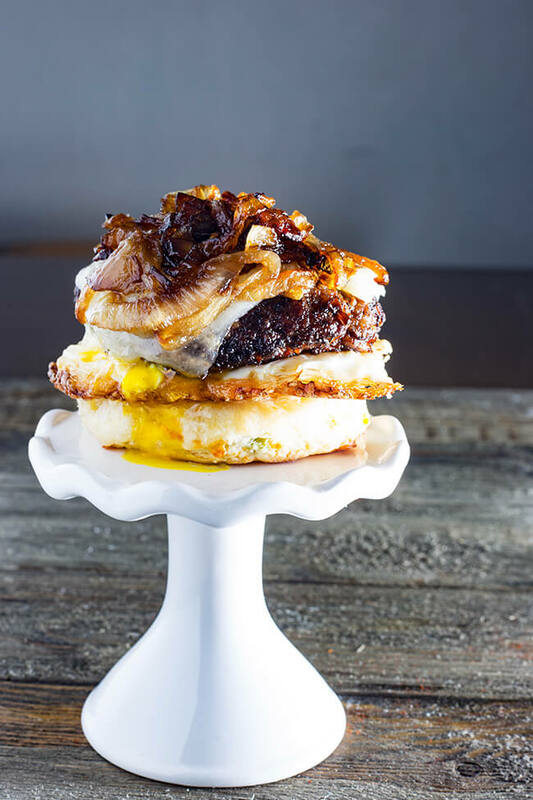 A mouthwatering country-fried steak on a freshly baked, scratch-made biscuit topped with a crispy fried runny egg and spicy caramelized onion. Heat Butter and Oil in a large saucepan over medium until melted and sizzling. Add Onions to butter. Cook, stirring, until onions are soft and starting to turn translucent, 1–2 minutes. Add salt and crushed red pepper. Reduce heat to medium-low and continue to cook onions. Stir every few minutes to prevent them from sticking- the trick is to not over stir it so that it browns but also not to leave it too long because it will burn. Cook for about 15–20 minutes when the onions are brown and almost melting away. Sprinkle both sides of the steak with salt and pepper. Mix together the flour, a pinch of salt and pepper, cayenne, and paprika. Turn to coat. Heat the oil in a large skillet over medium heat. Add the butter. Carefully place the steaks in the oil. Cook the meat in small batches, until the edges start to look golden brown, about 3-4 minutes each side. Check for the desired doneness. Remove the steak from pan and place on a paper towel-lined plate and keep them warm by covering lightly sheet of foil. Repeat until all the meat is cooked. Sift flour, baking powder, sugar and salt into a large mixing bowl. Transfer to a food processor. Cut frozen butter into cubes and add to flour, then pulse 6 or 7 times until it looks like a loose crumble. Place the dough back in the bowl, Stir in Cheddar and scallions. Then add buttermilk and stir with a spatula until it forms a rough ball (don’t worry if it is a little sticky). 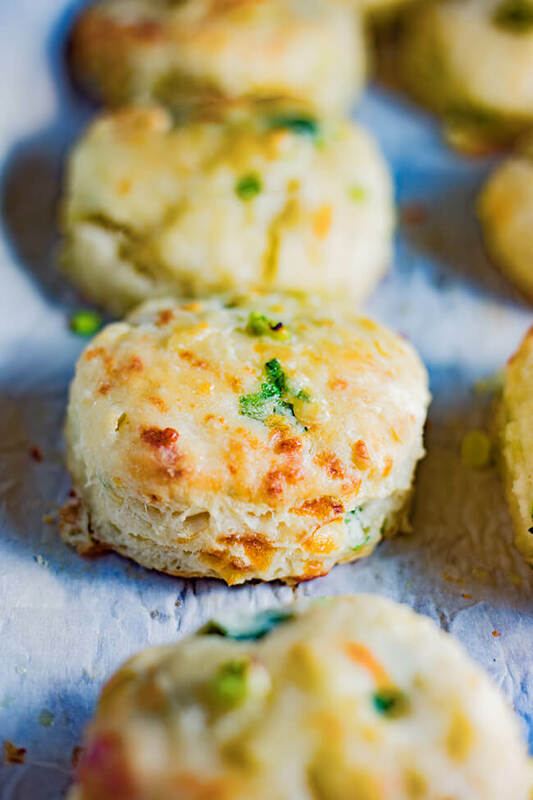 This Cheddar Scallion Biscuits Recipe makes the most tender, delicious, fluffy and cheesy biscuits. It is currently raining cats and dogs in Florida and these made the perfect addition to any soup or stew. Turn the dough out onto a floured surface and roll it into a rough rectangle, about an inch thick. Fold it over and gently roll it down again. Repeat 6 times. Gently roll out the dough once more, so that it forms a rectangle. Cut dough into biscuits using a floured glass or biscuit cutter. Do not twist cutter when cutting; this will crimp the edges of the biscuit causing it not to rise. If you have scraps just reform a rectangle and cut additional biscuits. Place biscuits on a baking sheet and place in oven. Make sure they're touching. Bake until golden brown, approximately 10 to 15 minutes. Serves 6 to 8. Brush on the melted butter and enjoy! NOTE: If you don't have a food processor, you can cut butter into flour in the mixing bowl using a grater, fork or a pastry cutter. Over a high flame, Add oil and let it heat until it just begins to almost smoke. Add your egg, reduce the heat to medium-high. Watch out for popping oil. It will start to get brown around the edges. Carefully- Spoon some of the oil over the egg. Let it cook until the white looks fully opaque, another minute. Remove from the heat. Shimmy a thin metal spatula under the egg, gently loosening any stuck parts. Place on paper- towel lined plate. Make the biscuits. Turn off the oven. Start on the Onions. when the onions are on low- start frying the steaks. Fry the Steaks and place the finished steaks in the now warm oven- while you finish frying the other steaks. Use a fork to open biscuit between layers. Place Steak then egg topped with cheese and onions.